Kachina was shown as a yearling and proved a force to be reckoned with. (see below). This lovely little mare has certainly proved to be one of our top mares. 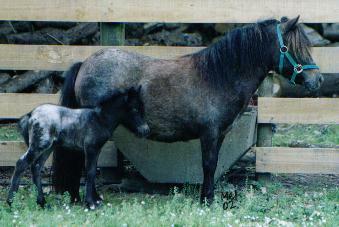 Kiki is pictured with her first foal - the Multi-Supreme Pinehaven Lady Sings the Blues - NZMHA 2005 National Show Runner Up Supreme Champion, 2005 NZMHA RU Hi Point Yearling Filly of the Year (A), 2005 NZMHA 4th Overall Halter Horse of the Year (A). Indi is a lovely mare and was lightly shown as a 2 year old, placing consistently through the season in her halter class. 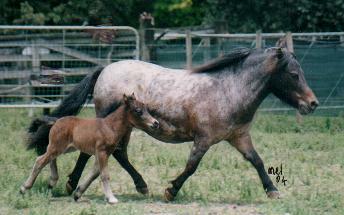 Indi is the dam of a lovely snowcap appaloosa filly - Pinehaven Indian Summer (AMHA). 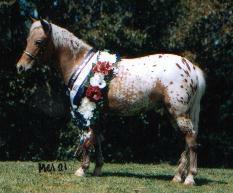 Indi is now in foal to Sierra Guns and Roses (Imp USA).